Protesters hold signs like this one, which demands an end to the intimidation of election officials, during a march in Nairobi, Aug. 1, 2017. 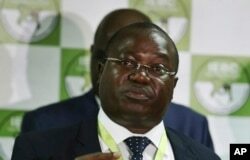 Several dozen protesters marched to the electoral commission offices Tuesday in central Nairobi, demanding justice for election official Chris Msando. Msando was found dead Monday after going missing Friday. According to the head of Kenya's electoral commission, Msando was tortured before he was killed. Anti-corruption campaigner John Githongo says Msando's killing was meant to derail the electoral process. FILE - Christopher Msando, an information technology official for Kenya's electoral commission, speaks at a press conference in Nairobi, July 6, 2017. "The timing of his torture and murder serves to undermine Kenya's elections management body at this most crucial time in the work of the IEBC [Independent Electoral and Boundaries Commission]," Githongo said. The nationwide vote is one week away, and the organization of the elections has been a source of tension during the past year. Msando was to oversee the use of biometric voter technology. 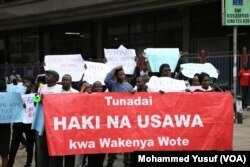 Kenya Human Rights Commission Executive Director George Kegoro helped organize the march. "Even as the investigation gets on its way, we remind the state of its duty to take whatever necessary measures it finds possible to secure the safety of IEBC commissioners and all its staff," Kegoro said. "An intimidated and fearful staff cannot fully deliver its mandate or respect its oath to act without fear or favor in carrying out their important responsibilities … [as] entrusted by the citizens of Kenya." Several dozen protesters march to the electoral commission offices demanding an investigation into the murder of Independent Electoral and Boundaries Commission senior official Chris Msando, in Nairobi, Aug. 1, 2017. Political parties on both sides have condemned Msando's killing. The ruling Jubilee coalition issued a statement urging police to investigate, while one of the leaders of the main opposition alliance, Musalia Mudavadi, spoke to reporters. "Chris [Msando], on television last week, assured Kenyans that they need not worry about the Kenya Integrated Electronic [Elections] Management System [KIEMS], as he was sure it would work," Mudavadi said. "That no effort was made to camouflage this killing as an accident shows the determination of the killers to send a chilling message that they will stop at nothing to ensure the outcome that they desire." Electoral commission chairman Wafula Chebukati met with protesters and said the commission is determined to do its job. "We are mourning with the family, we are mourning with the IEBC family, but this country is bigger than all of us [and] we have a mandate to deliver to the Kenyan people," Chebukati said. Kenya's inspector general of police called Msando's killing "a crime of grave proportions" and said a team has been assembled to follow what he called "several crucial leads" to bring the murderers to justice. The United States and Britain have offered to assist Kenya in the investigation.